January 6th marks the 12th and officially the final day of Christmas. In Ireland, this day is known as Nollag na mBan or women’s Christmas. Traditionally it is meant as a day of rest for all the women of Ireland, who have been working tirelessly over Christmas preparing food, cleaning the house and looking after the constant flow of family and neighbours who were visiting during the holiday period. This is also the day that all Christmas decorations must come down, not a day before or after for fear of bad luck for the rest of the year! In the West of Ireland, it was common for many women to raise a few turkeys for the Christmas season, which would be sold alongside any eggs from other poultry. As this was the women’s responsibility, they kept any money earned. Anything left over after Christmas, could then be spent on themselves on Nollag na mBan. In days gone by, women would often gather in each other’s houses to chat and drink tea or sometimes visit the local pub, where they would sit in the snug and drink a small glass to mark the occasion. Men would stay at home, tend to children and look after any household chores. While times have (thankfully) changed and women are no longer restricted to working only in the home, I still see value in continuing the tradition of Nollag na mBan. For me, it is a great way to honour the wonderful women in Ireland- our mothers, grandmothers, aunts, sisters and friends. It is a day where we can take a moment to remember those who are no longer with us. It can also be seen as a way to recognise and celebrate the contribution Irish women have made to society. The important role of women during the 1916 Rising was highlighted through a number of publications and ceremonies last year. We also saw great public support and acknowledgement for the Waking the Feminists campaign, calling for equality for women across the Irish theatre sector. This gave rise to much valuable and badly needed debate and discussion, which resulted in Arts Council funding to research gender balance in the theatre sector within the last 10 years. It also led to a number of waking the feminist inspired events which took place in locations as far apart as Inis Óirr to New York. While Nollag na mBan is rooted in a time where women had clearly defined roles, I feel that now is the time where women reclaim the celebration, redefine the meaning and continue and preserve this very unique Irish Tradition. *the image accompanying this article is a traditional Celtic cross design, handstitched by my mother Maura Harrington using a Carrickmacross Lace thechnique, circa 1990. My father recently sold our family home. Because of this there was a need to venture up into the attic and go through the bags and boxes which had accumulated over the years. There were many years in this house and there were 7 of us living in this home so as you can imagine there was quite a build-up. Some things needed to go in the skip, some things would be used again and some other things were simply too precious to be thrown out. There were bags and bags of old linen. And when I say linen, I don’t mean actual linen, but rather old bed sheets, pillow cases, duvet covers and that kind of thing. I opened the bags and searched through. Childhood memories of course came flooding back. My old duvet cover made me remember my old room. The posters on the wall, my little trinkets on my locker, my locker! My friends who used to hang out in that room; the laughs we used to have; the noise we used to make. But, back to reality, I was in the attic because I had a job to do and part of that job required me to be really ruthless. The duvet cover had to go! There were many items there from my mother’s time. This of course was very difficult. A part of me believes that fabric, in some sense absorbs the passing of time and because of this, it also absorbs the memories. Amongst the countless pillow cases and old sheets, I spied a bit of lace. I pulled it out. It was an antimacassar. 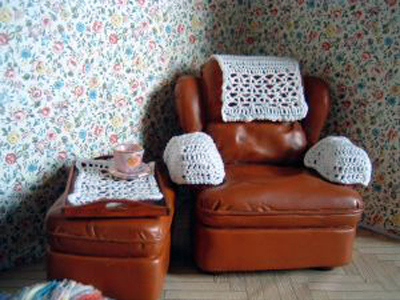 For those of you who don’t know an antimacassar is a small cloth which is placed on the back of a chair or couch to prevent the head of the person sitting causing any discolouration to the upholstery. In the early 19th century men would wear Macasser Oil in their hair, hence the name of these very functional pieces of fabric. I remember my mother’s antimacassars: 3 on the back of the couch, one for every seat and one on each arm-chair. She made them, white cotton fabric with a white crochet lace trim. The crochet lace was the same style of crochet lace she used to make our communion dress, which was passed down between the 3 girls. I remembered it all. I remembered that couch, I remembered the next couch, I remembered the sitting room, I remembered Christmas morning, I remembered our dog, I remembered the glass coffee table and I also remember smashing the glass coffee table! Seemingly random memories evoked by this one piece of fabric. Magical. This, I was keeping. It’s funny how when something has been made by hand, it has so much more meaning and becomes so difficult to part with. 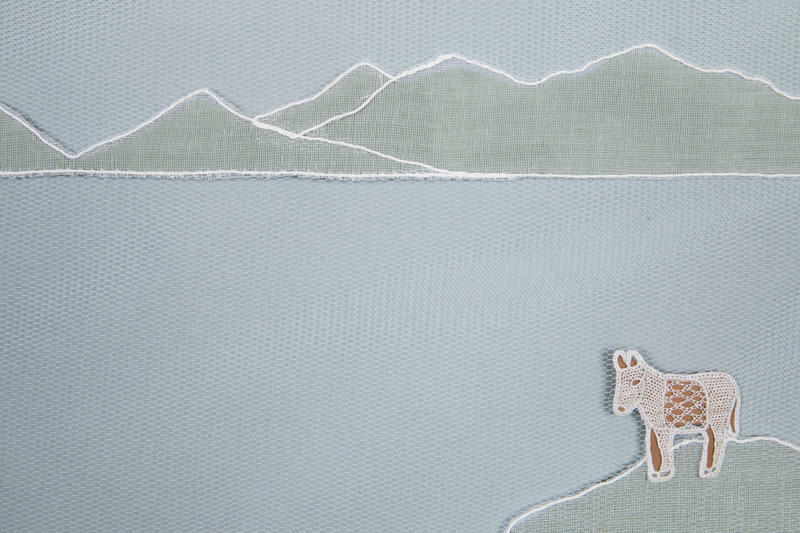 For me, this fabric has a story to tell and hopefully there’ll be another chapter to its tale. When we think of lacemaking, we can all be forgiven for having an image of a poor unfortunate peasant girl, sitting by a fire, needle and thread in hand with the last light of the last candle flickering away. Indeed this was the situation for many a lace maker. However, I’m going to be quite controversial here and offer a slightly more positive twist on the Irish Lace Story. 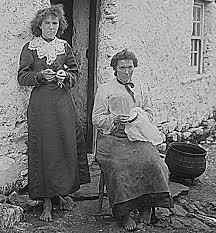 Ireland during the 19th century was an impoverished region. Most households depended on the little money they earned from agriculture and it was a time of great financial hardship. When the wife of the rector of Donaghmoyne, Mrs Grey Porter opened a lace school near Carrickmacross, at least one member of almost every family in the area was employed here. All of the lace makers were women. I cannot help but consider this as somewhat progressive. Not only were these women highlighting a woman’s role was not only in the home (at a time when a woman’s role was most definitely in the home!) but they were also making a significant contribution to the financial survival of their households. Similarly, when the lace school was established in Youghal in the wake of the Great Famine, within 5 years a thriving business was operating employing up to 70 women and dozens more who were working from home. Amazing pieces of needlepoint lace were being produced for sale and export all around the world. The industry spread to a number of towns across the country including the town of Kenmare in the nearby Co. Kerry. Here a new school opened and employed hundreds of women locally. Not only had the town suffered greatly from the famine but the completion of the Holy Cross Church in 1864, meant a huge increase in unemployment as most of the men had been employed as labourers. Once again, the women of the town were able to find work and provide for their families. Now, I’m fully aware that these were desperate times and people were more concerned with basic survival rather than any other greater social issues but I can’t help but feel the lacemaking industry in Ireland provided women with a sense of independence. 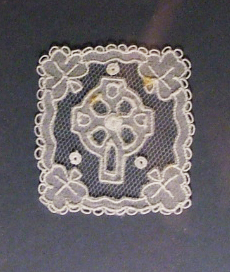 In fact, Ireland was one of the few countries in the world where single women could emigrate because they were in a position to pay their own fare and they were in a position to do this from the money they earned from making lace. When I was researching for my thesis I travelled to Clones to visit Mamo Mc Donald. Mamo is a bit of a lace expert, not as someone who makes lace but someone who talks about lace. She recalled a number of women who had bought farms with the money they made from lace and educated their children with the money they made from lace. So while lacemaking from an early stage became associated with poverty and hardship, there were clearly a few lace makers who saw it as an opportunity; an opportunity to earn money, an opportunity to provide and in effect an opportunity to become independent. By the turn of the 20th century, lacemaking was the 2nd largest industry in the country after agriculture! What an achievement! This is something I for one, am very proud of. So on this day Jan 6th 2016, which is known in Ireland as Women’s Little Christmas or Nollaig na mBan, I would like to give a nod to the lacemakers of Ireland for finding power in hardship and creating a sense of independence for Mná na hÉireann.